When you register for a Plant Nite session, you are encouraged to arrive a bit early to order your food and drinks since you don’t want to be distracted by your meal once you are in creative mode. Compared to my Paint Nite experience, Plant Nite at Marche Restaurant had fewer attendees, which made the experience more intimate. Tables are set up with a planter, succulent plants, gravel and an apron at each table setting to begin with. We had a few minutes to get to know our neighbours before our congenial instructor Rachel Sproule introduced herself and told us what was in store. Applying the mini white stones on the soil in the planter at Plant Nite in Toronto. We began by placing a layer of gravel in the ceramic planter and then filling our ceramic planter about ¾ full of soil. 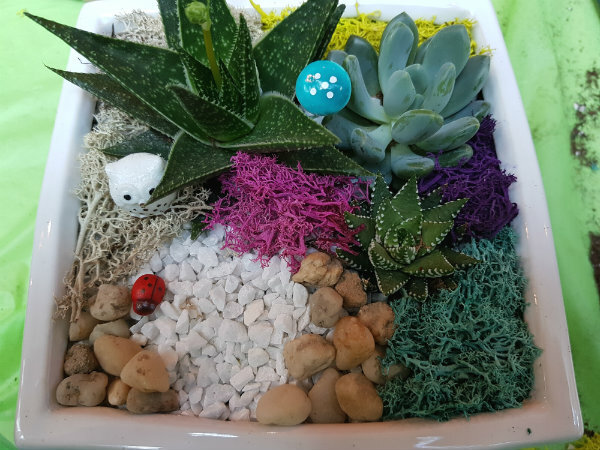 A design graph was provided to demonstrate several possible ways of grouping the succulents. 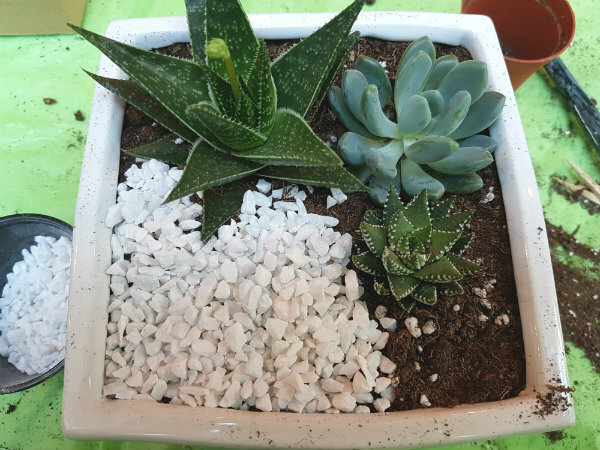 We then removed our succulent plants from their containers and planted them in the soil. The next step involved placing mini white stones along the surface of the soil. 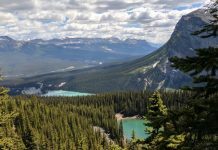 We were then provided with coloured moss which comes in stunning colours of purple, pink, turquoise and chartreuse, as well as natural-coloured moss. We were instructed to tuck the moss around the plants or wherever we wanted in the planters. The coloured moss really turns your planter into an eye-pleasing centerpiece! Rachel then handed out the mushrooms, which come in blue, red and purple, to be added to the planter. And of course, you can’t forget the owl, since this arrangement is called “Cozy Owl White Ceramic Square Dish.” I chose a white owl, although there were a few black owls as well. One of my neighbour’s Plant Nite creations. I found Plant Nite at Marche Restaurant to be very relaxing – less intense than Paint Nite! Rachel definitely made our experience enjoyable! 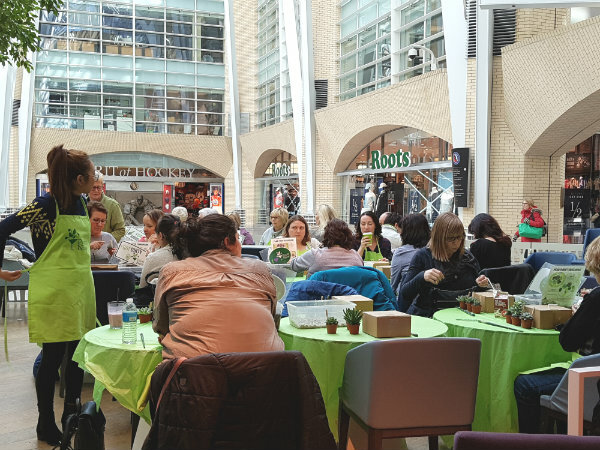 Plant Nite would make a great Easter, Mother’s Day, bridesmaid or graduation gift…see our giveaway below to enter to win one admission to Paint Nite anywhere in Canada. 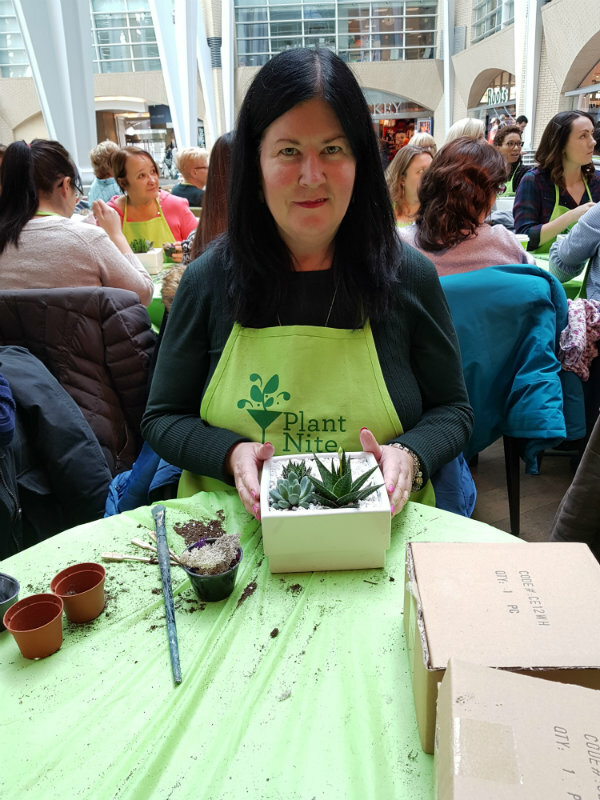 Me at Plant Nite at Marche Restaurant in Toronto. Our giveaway to win one admission to Plant Nite has now closed. Congratulations to Fran! I have never attended a paint or plant night. I would like too! I’ve been to paint night and loved it. I’d love to try a plant night! Do these flower arrangements need to be watered? Silly question but I’m totallh curious. Thank you for sharing your experience with us. i haven’t been to either and would love to do this. love your arrangement, btw, it’s adorbs! I haven’t yet, but I am hoping to soon! I have been to a paint night, this plant night looks like another relaxing experience for my local autism mom’s group to attend! Thanks for sharing the news! No, but it sounds so fun! No I have never been to Plant Nite but it sounds like so much fun! I love my indoor plants and am always looking for creative ideas. I’ve never been to either event before. I’ve never been to a Plant Nite, but my sister and niece went and they loved it. I’ve never been to Plant Nite nor Paint Nite. I’m more interested in checking out Plant Nite than painting, planting seems more fun. My house is riddled covered in my Paint Nite creations! I never thought I was capable of creating such great work until my first Paint Nite session. I didn’t know about Plant Nite, I’ll definitely have to check it out! Wow very imorssed those plants looks stunning, would love to try this! I haven’t had the chance yet! I’ve been to a paint nite but not a plant nite yet, thanks for the chance! I’ve never been to either but it sounds like a lot of fun! No I have never been to one before! Have not been to either but have been planning on going one of these days! i haven’t attended a plant or paint nite but i hope to soon! I have not been to plant nite or paint nite before, sounds fun! What a great idea. 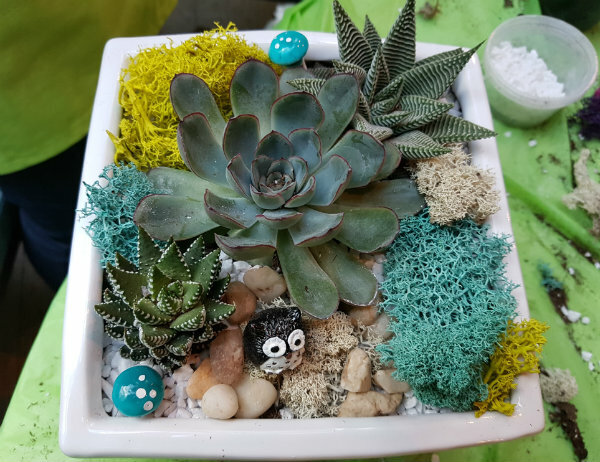 I hope I can attend plant nite some day, I love succulents! I haven’t been to both but my sister goes to paint nite all the time and has a blast! I haven’t been to either. I am not into painting, but Plant night sounds like it was made for me! I would really enjoy Plant night. Only been to paint nite but I wa t to try this.